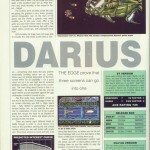 Darius + was advertised in various magazines, and was advertised by The Edge for all machines, including the Commodore 64. 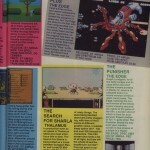 The game is a conversion of a popular arcade by Taito, and eventually did surface on the Amiga, Spectrum (http://www.worldofspectrum.org/infoseekid.cgi?id=0001254) and ST machines, but sadly the conversions were not too great. 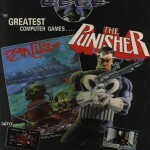 The C64 version never surfaced at all. “I did some test work on it, as I did the original ST and Amiga versions. The only thing that was done on it was the sprites and the first level, the game was canned after 4 weeks into development due the the coder leaving after a row over payments. So we can confirm that we are looking for a very early development version of the game, with at least one level to look at. Could another developer have picked up the game later to do more?… We are not sure yet. In 2013, Jonathan Kendall told GTW64 that he was the programmer that Tahir was likely referring to. 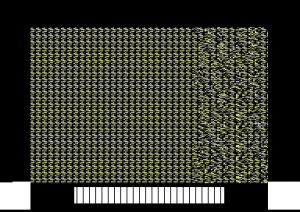 Jonathan had started the C64 version of the game, and left after deciding he didn’t like anything about how the conversion was being handled and would be better to return to independent projects. The game was being developed by Zeit Corps. Jonathan also mentioned that he wasn’t sure for sure if the Darius+ version continued following his departure from Zeit Corps. We are not sure how much got started exactly, we assume just the first level and hope it may be findable. Pete Dabbs additionally tells us that he approached The Edge to actually convert the game, but their demands for the C64 were way too high, and after a argument The Edge felt they could find someone else who could do the job. Maybe they did after reading the ACE review? Another recent thing could be that CRL’s Inner Space contains bits of Darius+ from the C64, at least on the 4th-6th levels possibly. Jason Kelk suggesting that one of the later levels looks very much like a Darius+ level. 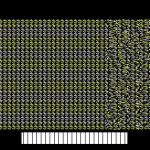 Considering Inner Space contains a mixture of sprites and bits from other C64 games, could it also contain something unused from a C64 conversion of Darius+?…. And that’s it!…. We’ll get assembled versions added very soon. There are slight varients on the same disk, along with a few other bits of source code which Jonathan has written and has allowed us to share. It is possible that Tahir still has his graphics for the first level, and if so – Jonathan has offered to patch in the graphics so we can see particially more of what may have been. 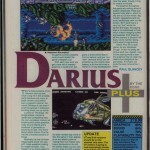 But for now, this seems to be all there ever was of a Darius + conversion on the C64! “Reading artist Tahir Rashid’s comments, I believe the coder he is referring to, who left following a row over payments, might be me. I started the 64 version of the game and left after deciding I didn’t like anything about how the conversion was being handled and would be better to return to independent projects. I cannot say with any degree of certainty that the 64 Darius+ conversion project continued following my departure from Zeit Corps. I can say for certain that I do not know of any code written for the game except the code I wrote myself. This, sadly for you, means I cannot take you closer having a working version of the game. Either Christian Pennycate or the internal staff at The Edge may be a better port of call for discovering if the conversion process halted on in my absence. Since this is likely to take me some considerable time I felt you might, since you have published feedback around it, be interested in seeing what there is of Darius+. First I’d like to lower your expectations. Darius is just the scroll code. There are no graphics, no user interaction, no sprites. Nothing but a thick white mist drifting from right to left one pixel at a time: You can’t do anything with it and there is nothing to signify it is the game except the Darius file name and comment in the code. “Speaking of impossible to convert games, when I worked at ESP (yeah, those pesky Search for Sharla people hehe) we went to (I think it was) The Edge (who were in covent garden, and the car got clamped while we were there grrr) to see them about doing an arcade conversion they’d just got the rights for (can’t remember what it was now, some horizontaly scrolling shooter) and they’d just seen some compunet demos using side borders and they INSISTED that we HAD to have the whole screen scrolling into the borders and sprite multiplexing etc etc, bearing in mind that at this time nobody had done side border stuff with a character screen still being displayed and the fact that this is only possible using a certain number of sprites per line AND the fact that you’ve now lost most of your raster time AND no no no no!! (hehe). When I told them this was impossible the boss of the place started a big rant and said he’d get someone else to do it instead because he’d seen demos with things in the side borders (don’t you love non-technical people trying to tell you that things can be done). C+VG Issue 98, Page 92 review might be worth putting up.Box out mentions fact they’ve seen nothing of C64 (or Spectrum) versions..which sounded rather alarming back then.